Propagation of the Faith Boston: How Was Your Lent Spent? 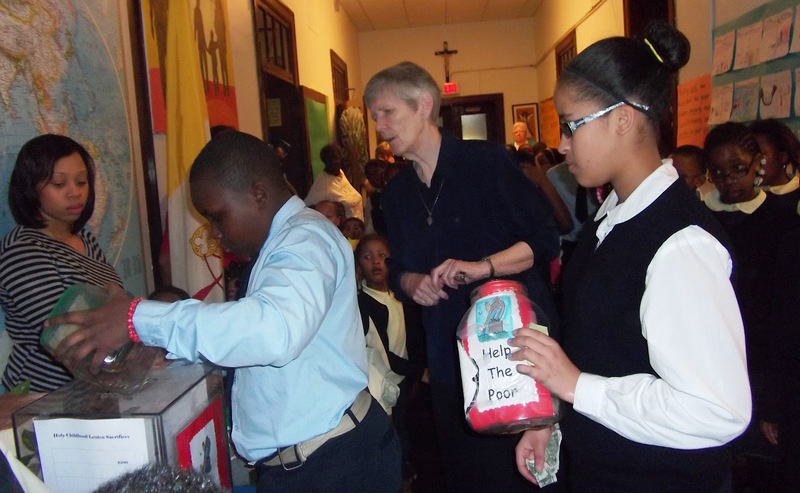 According to Sister Barbara at St. Patrick School in Roxbury, this past Lent was one of silence and awareness of others in need for the students of that school. Every day, the children would drop their mission sacrifices for the Holy Childhood Association into their classroom Mission Bank. On each Friday of Lent, these HCA members would gather silently in their front hallway under a large map of the world while a hymn played. On a table under the map was a large clear container set on a table with a thermometer on its side. The students had set themselves a goal of raising $500 for children in the missions through the Holy Childhood Association. The thermometer would help them to measure their progress. Sister Barbara talked to them each Friday about the children of the missions: those in need of food, clothing, education, clean water and most especially, the love of Jesus in their lives. The students would listen quietly as Sister spoke of their responsibility as Christians to bring the Good News of Jesus Christ in word and action to children everywhere. “Their silence and reverence was really quite beautiful,” said Sister Barbara. “It is so important to raise their awareness of the responsibilities they have. It was a holy time for them,” she continued. When Sister finished speaking, the students were called forward in groups of three, each representing a grade or class, to pour out their sacrifices into the large, communal container. When all the classes had made their weekly contribution, they would recite their Morning Prayer as a school: an Our Father, a Hail Mary and the Prayer of St. Francis. Then they quietly returned to their classrooms to start their school day. Through mission education and The Holy Childhood Association, the students of St. Patrick School in Roxbury are learning the importance of silently and reverently offering their prayers and sacrifices for those who Jesus has pointed us towards – the least of our brothers and sisters. NB: The HCA members at St. Patrick School shattered their own goal, raising $740 for children in the missions!